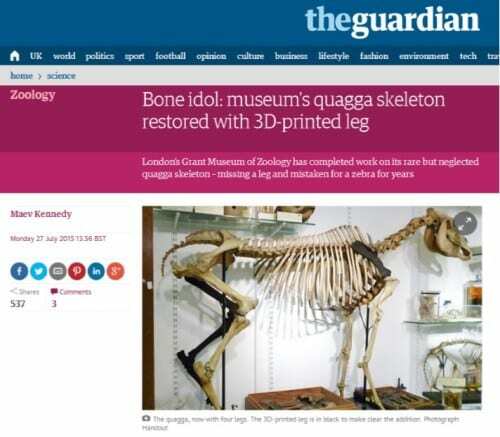 Specifically it’s been a good year for the Grant Museum quagga – the only one on display in the UK. 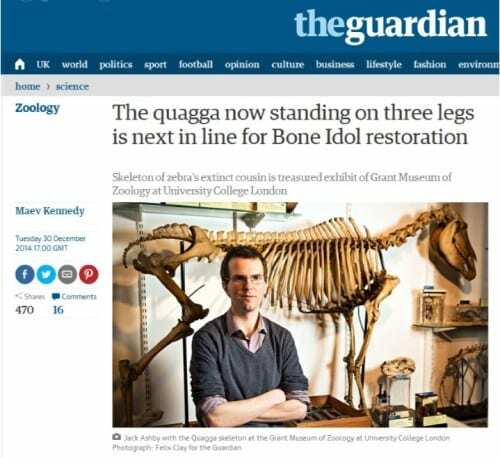 Our quagga started the year with a taste of media stardom, having appeared in a good number of news stories, including a high profile article in the Guardian reporting on our Bone Idols: Protecting our Iconic Skeletons conservation campaign, just before the skeleton left the Museum for her own treatment. The project, centred on our quagga and rhino, aims to preserve 39 of our biggest and most significant skeletons for the long term future. The importance of the quagga was the real hook for the media success, and we are now well on our way, with 31 of the 39 objects completed. In May, we reported that our quagga had returned from an intensive few months undergoing major conservation. 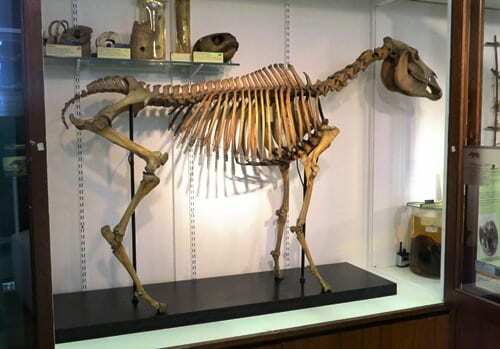 Specialist skeleton conservator Nigel Larkin had dismantled the invaluable specimen, chemically cleaned all her bones, removed some oozing black fatty deposits from the sternum, and remounted her on a new skeleton-friendly frame. Now our quagga’s neck is on the right way up, her leg meets her hip, her spine is accurately curved and her bones are not grimy. As beautiful, shiny, and protected for the future as she was, our quagga still had a problem – she was missing a leg and a shoulder blade. This was about to change. One seventh (or one sixth, depending on if we can track down one that is eluding me) of the world’s quagga skeletons are now in a much better state than twelve months ago, meaning that generations to come will be able to learn the quaggas’ tragic story, and that is something to celebrate. We’re also pleased that this project has given this beautiful extinct animal some time in the limelight. Join us, please, in raising a glass to the quagga, and other little-known species that have suffered at the hands of people. 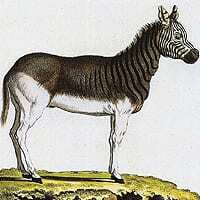 Happy Quagga Day. What a wonderful, heart-warming story. Well done (again) all at the Grant Museum!